When most people think of spring break activities, visions of poolside fun, road trips and time with family and friends likely come to mind – not a trip to Ethiopia. But for six OSU students, a spring break trip to East Africa offered them the opportunity to be involved in peer workshops, earn two credit hours and experience life in another part of the world. Four CPHHS Global Health graduate students – Virginia “Ginny” Katz, Molly Mew, Katrina Mullins and Pax Matipwiri – Health Promotion and Health Behavior graduate student Anna Osborn and Anthropology graduate student Micknai “Mickey” Arefaine joined CPHHS Assistant Professor Stephanie Grutzmacher in March to build on previous trips with Debre Berhan University (DBU) and its faculty, staff and students. During the recent trip, students spilt into groups with DBU faculty. Each team worked together to prepare a workshop for their peers and shared their topic with the other teams. In addition to the facilitation and participation in the workshops, the group visited the project site and homes of women participating in an ongoing food security project. The group also collected a survey from DBU faculty to identify professional development priorities for future joint training activities. The survey results will be used as roadmap for the partnership. During the trip, the students experienced a synergy taking place, which left a lasting and personal impression, Stephanie says. Of course, the trip wasn’t all work and no play. 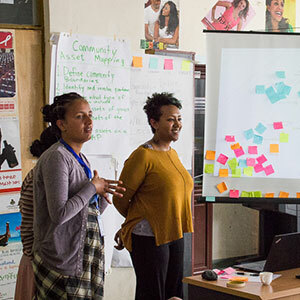 Once the workshops were complete, the group celebrated Ginny’s birthday at a traditional Ethiopian venue There was music, several rows of Christmas lights, singing in Amharic and a bounty of jokes. Ginny wants other students considering a global opportunity to know it’s worth it and adds to the educational experience. She even discovered that multimedia projects – one of her passions – was worth hauling bulky equipment and could be weaved into her professional future. She was able to film the experience and plans to create a website for the project. 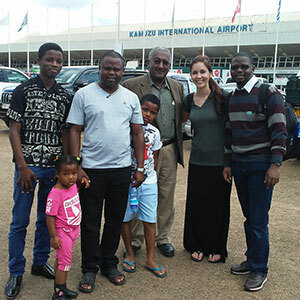 Pax, who in addition to being a student is also a medical doctor from Malawi, flew home after the trip to work on replicating the Ethiopia project in his hometown. He and Stephanie met with several community partners and conducted a strengths and needs assessment with Pax’s target population, which is individuals living with HIV/AIDS. The assessment has confirmed that there is a need and a desire for a food security project, similar to the one taking place in Ethiopia. Pax hopes to develop a program to help the community and the target group ensure sustainable food security and nutrition in the future. Pax hopes to pursue his doctorate in public health using his food security project in Malawi as the focus of his thesis.